Someone is obviously trolling us as a web experiment, right? The absurd online marketing machine behind Arcade Fire's upcoming disco album Everything Now has us longing for the days when they just released Reflektor graffiti around the world. In promoting the new release, they've launched stunt lawsuits, made questionable Twitter jokes and referenced the tabloids with their merch. It's safe to say we shouldn't take their online stunts at face value. Despite their newfound love of online pranks, however, the internet is taking the band's latest dress code request at face value. You might recall that the group demanded formal attire from their concertgoers back in 2013. In a self-referential news release, they've done the same thing for an upcoming Brooklyn show. As Brooklyn Vegan reports, the band released a message to those planning to attend their livestreaming show at Brooklyn's Prospect Hall on July 27. The statement says they refuse the right to deny entry to anyone that doesn't meet the requirements. Read the statement below. But they must be joking when they write "HIP & TRENDY" in all-caps, right? No cellphones, cameras or recording devices will be allowed at this show. Upon arrival, all phones and smart watches will be secured in Yondr pouches that will be unlocked at the end of the show. Guests maintain possession of their phones throughout the night, and if needed, may access their phones at designated Yondr unlocking stations in the lobby. Our dress code is HIP & TRENDY as if you are going to a concert or night out with friends! The event is standing-room-only so please plan accordingly. PLEASE DO NOT WEAR shorts, large logos, flip flops, tank tops, crop tops, baseball hats, solid white or red clothing. We reserve the right to deny entry to anyone dressed inappropriately. If you prefer talking about the band's music instead of their PR stunts, you can read Exclaim! 's definitive ranking of their songs here. Everything Now arrives on July 28 through Columbia. 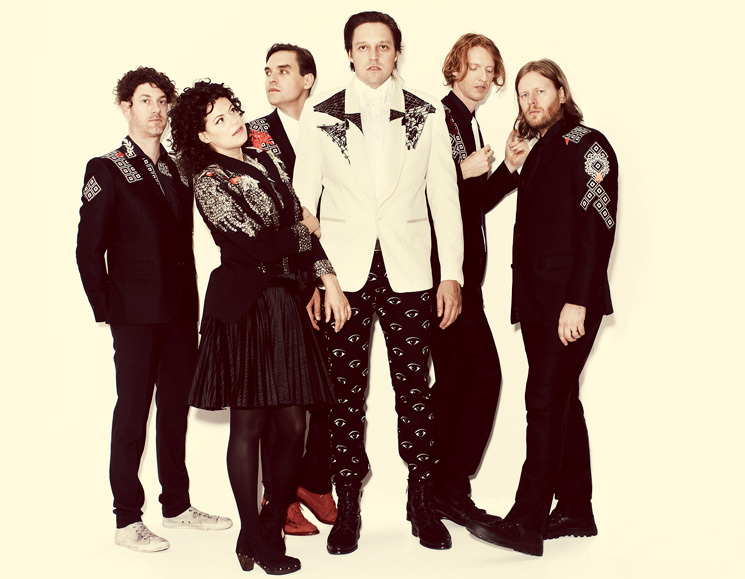 Arcade Fire's Brooklyn show will be livestreamed on Apple Music on July 27 starting from 5:30 p.m. EDT. You can watch it here. UPDATE (07/24, 4 p.m. EDT): Arcade Fire have responded to the dress code claims, telling fans to wear whatever they want to the shows. Read their tweets below.